Nominated for 10 Academy Awards including Best Picture, Best Director and Best Actor, The Gangs of New York is now available as an incredible and collectible piece of art from The Upper Deck Gallery. 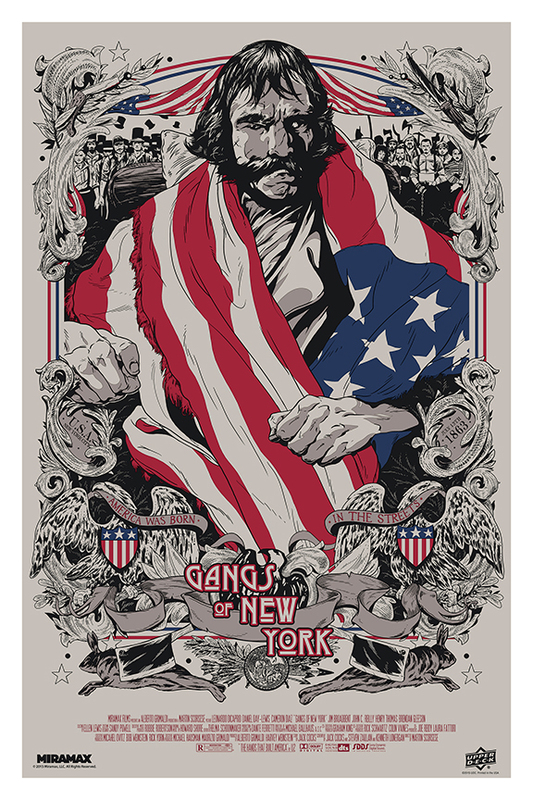 The 5th release in a lineup of limited edition prints, Gangs of New York joins the likes of fan favorites, including The Crow, Daredevil, Wolverine and more. The film debuted in 2002 as a fictionalized historical drama, set in the mid-19th century in the Five Points district of Lower Manhattan. The film was directed by Martin Scorsese and starred Daniel Day-Lewis as Bill “The Butcher” Cutting, a well-known crime boss and political kingmaker. A territorial battle between two rival gangs, The Natives and The Dead Rabbits, leads to revenge, murder and political corruption. The film culminates with a violent confrontation between Cutting and his mob with protagonist Amsterdam Vallon, played by Leonardo DiCaprio. The Upper Deck Gallery is paying homage to the film with two bold and never-before-seen posters that showcase Daniel Day Lewis as an injured Cutting draped in a tattered American flag. Featuring original artwork by award-winning illustrator Johnny Dombrowski, this 24” x 36” limited edition screen print captures the spirit of election fliers from the 1800’s in a stunning illustration. The print is now available exclusively at www.UpperDeckGallery.com for $59.99. 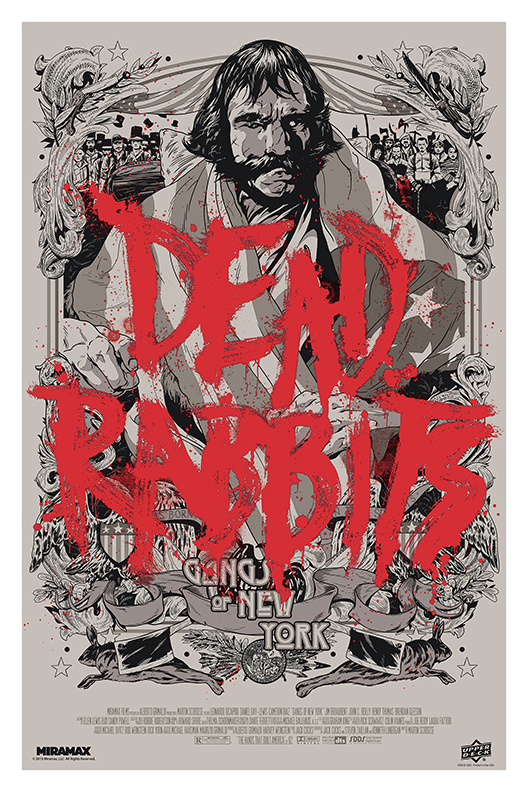 A short print variant edition makes a complete color shift and adds an emblazoned “Dead Rabbits” in graffiti-style writing. Hand numbered and limited to just 100, the 24” x 36” variant version is priced at $99.99 and available exclusively at www.UpperDeckGallery.com. Both versions are printed on premium heavy weight paper stock and are accompanied by an original Certificate of Authenticity. UD Gallery is a collection of premium prints that feature unique artwork of fan-favorite comic and movie characters. All releases are limited-edition, one time print runs of original works of art created by top-tier artists. Each print includes a corresponding Certificate of Authenticity from Upper Deck. For more information about the UD Gallery and to sign up for new release notifications, visit www.UpperDeckGallery.com.